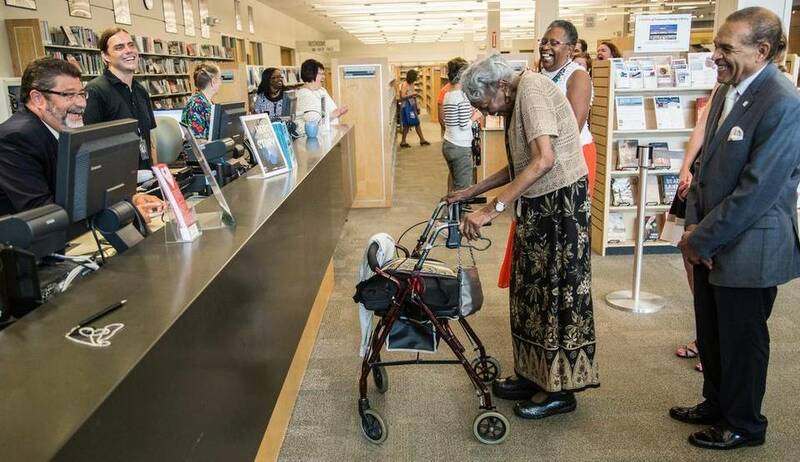 In 1942, Pearl Thompson was a student at Shaw University when she was denied a library card at a Raleigh, North Carolina public library because she was black. She was prevented from checking out a book assigned for a history class, and sent to the basement with a library staff member where she had to stay to read it. Now, seventy-three years later, Thompson has finally obtained a library card. Thompson says she entered the Olivia Raney Library that day, even though she knew it was for whites only, because Shaw did not have the book she needed for class. “I expected to go in and get a book,” she said. Thompson taught for 12 years in Raleigh's segregated black schools after graduating from Shaw, before moving to Ohio with her husband. She now lives in an assisted-living facility in Cincinnati, and suffers from kidney disease and heart problems. On her wish list of things she wanted to do, though, was coming home to visit North Carolina and receive the library card she'd been denied. Thompson was an advocate for her students as a North Carolina teacher, the Raleigh News and Observer reports. She was determined to give black children the opportunity to read, and unafraid to ask for what was needed in order to make that happen. She traveled from school to school throughout the city to help students, setting up space wherever she could if no classroom was available.